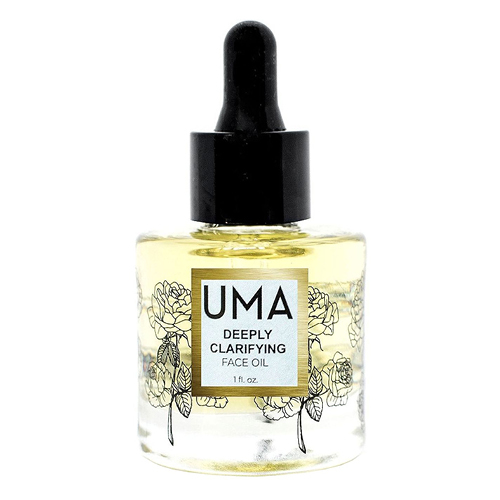 Deeply Clarifying Face Oil by UMA Oils is gentle enough for sensitive skin, yet high-impact enough to combat signs of impurities and bacteria in acne-prone skin. Made with lavender, clary sage, clove and tea tree essential oils for a moisturizing and balancing feel, this gives skin a look of balanced natural sebum production, and inhibits the appearance of excess oil production. Crafted in a grapeseed oil base, makes this blend rich in linoleic acid and Omega-3 fatty acids, for reducing signs of inflammation. This is an excellent choice for those with oily or combination skin. Every morning and evening after your cleansing routine, massage 3-4 drops between your palms, and gently pat in a firm circular motion all over your face, neck and décolletage. This may be used on its own or over serum.